Doctors of chiropractic promote health and wellness through proper spinal health as well as proper nutrition, exercise, and lifestyle choices. This non drug approach to pain management and eradication combined with chiropractors’ training in nutrition, health and wellness give them the ability to coach patients to improve health, quality of life, and well being. 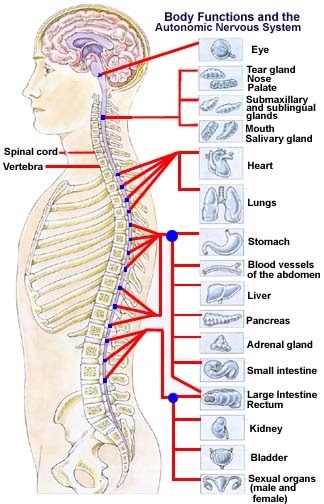 Every movement and function of the body is controlled by the brain and spinal cord. Motor nerves lead out of the spinal cord to control movement in the body while sensory nerves enter into the spinal cord communicating messages from the body back to the brain. Together, the motor and sensory nerves form more than 50 nerve roots, which run through small holes in the bones of the spinal column. Each one of these nerve roots has the potential to become irritated and cause health problems, ranging from back pain to organ failure, if the bones designed to house and protect them compress or rub against the nerve. Chiropractors detect and correct any misalignment of the spinal bones that cause this nerve interference, allowing the body to function as it was designed: fully, completely, without any interference. * Anything (muscle, organs, tissue) that is innervated by a nerve can be affected by a subluxation (spinal misalignment’s)! Have your spine checked today and begin a path toward lifetime wellness!